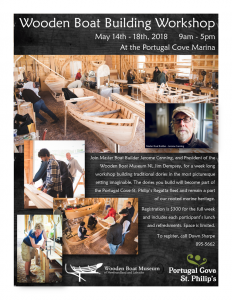 The Town of Portugal Cove-St. Philip’s is pleased to offer an exciting Wooden Boat Building Workshop. The two boats created by the team in the workshop will make up the new PCSP regatta fleet and will be used in the PCSP regattas for years to come! Call Dawn to register today at 895-5662. Space is limited!